Jaco Pastorius had a penchant for de-fretting Fender Jazz basses, especially instruments which he felt had the 'potential', as mentioned in my last post on the 'Jaco bass' on eBay. The electric fretless sound -- Jazz bass bridge pickup turned up, with the tone control rolled off -- became Jaco's trademark. But Jaco also favored roundwound strings which would inevitably eat into the fretless rosewood fingerboards on his Jazz basses. To fix the problem, he would coat his fingerboards in several coats of marine epoxy, carefully sanding them down between each coat to build a thick layer. In interviews he often mentioned Petit's Poly-Poxy -- a marine epoxy used to coat the underside of boats -- as his epoxy of choice. 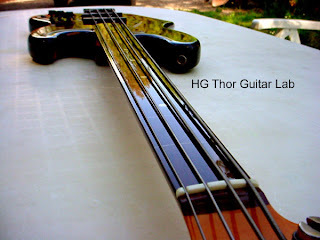 For a few years now, HG Thor has taken the epoxied fretless fingerboard concept and turned it into a veritable art form. Specializing in fretted-to-fretless conversions, HG Thor uses an undisclosed technique to apply multiple coats of epoxy, before buffing the fingerboards to a mirror-finish. The company also specializes in restoring poorly de-fretted instruments, filling in chips with rosewood, ebony or maple dust mixed with glue, before applying the epoxy finish. 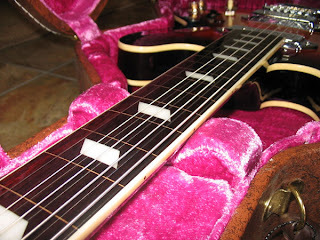 There is also a page on the company's website dedicated to a de-fretted and epoxied Epiphone Casino here, in case any of you fretless guitar explorers out there are feeling left out.